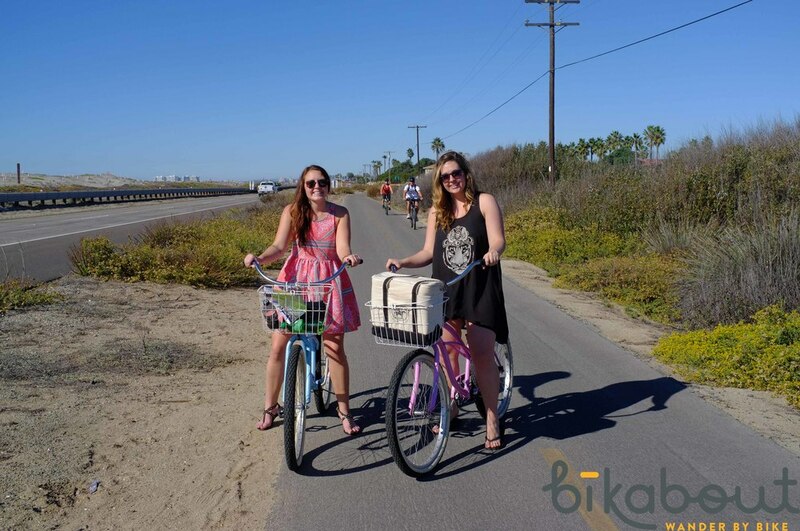 San Diego city guide - biking tips, maps, transportation, lodging, bike rentals and more! I am embarrassed to admit that I knew nothing about San Diego besides watching Anchor Man, which may or may not have been filmed there. Both of my visits to the city were prompted by it hosting the National Bike Tourism conference, which I was lucky to attend. Right off the bat the city blew me away because I flew with my Brompton folding bike on bike friendly JetBlue and was pleasantly surprised that I could ride from the airport terminal a short 3 miles on a scenic, waterfront path to downtown. "Gateway Drugs for the Bike Curious", a mobile session that I coordinated for the National Bike Tourism conference that got professionals in the industry <gasp> outside on bikes. This is a beautiful, oval shaped route. Take the ferry from downtown to Coronado and bike almost exclusively on the Bayshore Bikeway, an off-road path. Once you round the southern tip of the bay and the trail ends, we recommend hopping on the first trolley you see to get back downtown. The rest of the ride is through semi-industrial areas, on and off heavy trafficked streets with large trucks. Coronado Ferry is $4.75 one way (bikes free) from Broadway Pier or the Convention Center to Coronado Ferry Landing. Me very much enjoying Silver Strand Beach in November. A neat little bridge connecting two bikeable neighborhoods: Hillcrest & University Heights. This is a scenic, waterfront path stretching from west of downtown, right past the airport and ending around the stadium. A long, straight-as-can-be bike path along the San Diego River. North Park is a great neighborhood on the city's northwest side. Tons of shops and restaurants. I've heard that its southern counterpart, South Park, is also wonderful. Why the zoo gets all the attention when Balboa Park's museum campus is one of the most beautiful public spaces in the U.S. is beyond me. The architecture, crazy old trees and culture will keep you occupied for a day, at least. It's hard to believe this was an empty lot. The Quartyard features a few places to grab freshly prepared food, beer, cocktails while enjoying live music. Below were my favorite places to eat, drink and shop. This is, by no means, a comprehensive list and I recommend checking out Bikabout's Pinterest board or Foursquare list using their handy apps. It's an unbearable thing for a midwestern girl to be allergic to gluten, but there it is. I love the culture of beer, though, and San Diego is brimming with it. There is one gluten free brewery called Duck Foot that I tried at Panama66 (see below) and it was a good one. My husband, the now beer nerd in the family, didn't join me for this trip, but these are the breweries he's excited about: Green Flash, Ballast Point, Council Brew and Societe Brewing Company. Panama66 is a biergarten tucked in behind the San Diego Art Museum. It was gorgeous during the day and I can imagine it would be even better at night with the surrounding architecture lit up. Fantastic beer selection, too! Waypoint Public & Dark Horse Coffee are right next to each other which means you can grab a craft beer and then some caffeine afterwards to wake you up. BONUS PERK - 10% DISCOUNT FOR BIKING THERE! Pour over coffee is served in this multi-use space that I think used to be an auto body shop. This sister restaurant to Panama66 is owned by someone who loves the biking community. Urban Solace is a farm to table restaurant with a great little patio and nice wine selection. I could write three paragraphs on my love for this place. For crying out loud, they have gluten free french toast! Simply one of the best breakfasts I've ever had paired with delicious craft cocktails. Pigment is like a locally owned Anthropologie, but exclusively selling home goods, gifts and accessories. If you need to pick up a gift for someone who is taking care of your dog at home, this is your place. #1 - We want ambassadors and route curators! #2 - Tell the city that active transportation is important to you with this quick survey.